The Texas Tenors are a classical crossover vocal trio formed in 2009 by country singer JC Fisher, pop singer Marcus Collins, and opera singer John Hagen. They were a top four finalist in the fourth season of “America’s Got Talent,” making them the highest ranking vocal group in the show's history. Since their whirlwind debut on “America's Got Talent,” The Texas Tenors have accumulated a long list of awards and accolades and an enthusiastic fan base, including three Emmy Awards for the PBS special You Should Dream. They have performed more than 1000 concerts around the world, including a 24-city tour of the United Kingdom and China, and collaborated with some of the most prestigious symphonies in the United States including the Cleveland Pops, Houston Symphony, and the Pittsburgh Symphony. 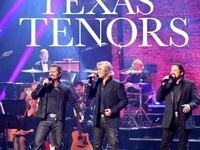 The Texas Tenors were recently named the #10 Classical Artist in the world according to Billboard magazine.